So! I have decided to stash bust some sock yarn so that i can pare down the sock heard and *ahem* buy more. :D Thus far, I am taking all my leftover skeins and knitting (loosely based on the Maison-Dixon book)a log cabin blanket-ish. I'll take some pictures shortly. Other than that I've not don emuch else, other than try to stay away from socks until summer since I joined The Summer of Socks 2008 (linky-linky) so that I can be all geared up for knitting socks, socks, socks. Oh, and socks. My goal in de-stashing is to get all my current partial skeins knitte dup and then I can buy 3 skeind from BMFA I'm thinking this one, this one, and this one to start! I especially love the last one. I'm thinking Monkeys out of them. Hi everyone, long time no hear...er, type. I hope things are going well for all of you. My life has been lovely crazy and while a ton of knitting has been getting done (a whole bunch of which I can't post about since it's for a secret swap) I've just not the pizazz to post about it all. So! First up, I finished my Secret of the Stole 2 KAL by Nautical Knitter And while Savannah (that's the stole's name) is done, do you think I have a finished picture of it? Of course not. I did try though, and Matthew helped me take some pictures of me holding it (all of which were awful) so I'll have to wait for a nice day and try for later. Speaking of Matthew, he won't wear most knitted things (ie the bloody socks I slaved away over) but that boy loves himself a beanie. So after the last black one I made him was stolen, for our 6 month anniversary I knit him another one. This time I embroidered a T on it so he'd be able to tell what was his. Surprise, surprise it came home when he got back from the field. Now his friend wants one. 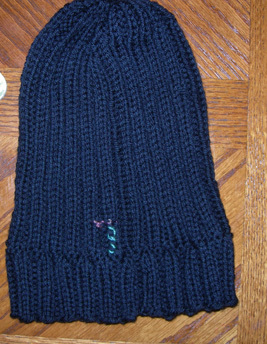 It's just your typical k2p2 rib beanie. 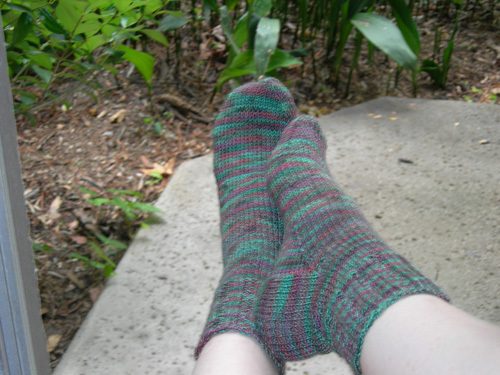 And my new favroite pair (in progress still) of socks, in CTH again is March's shipment of the Loopy Ewe Sock Club. The pattern is to die for and I'm now through the cuff of the 2nd sock despite my pictures showing the cuff of the first sock. (because oyu know, I'm super amazing at proper photography. 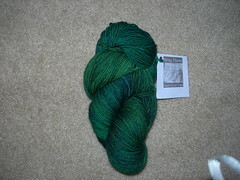 And very long over due: dmop on Ravelry sent me the most gorgeous skein of sock yarn ever! It's such a beautiful deep rich green that made me all squeely. Why? 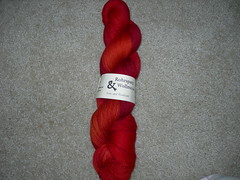 Well I had sent her off some Wollmeise I had won in the last Loopy Ewe sneakup and decided to share the love. I think I made out way better but that's because dmop is awesome! Also this month's shipment happens to be Wollmeise in a bright lovely red color (that I'd never would have picked out myself but love!) and a beautiful pattern...that calls for knitting it toe-up and on 2 circs. Can't do either. But I'm sure I could learn?